This album contains a total of 216 individual sheets of U.S. Navy "preliminary design" plans, dating from March 1911 through September 1925. These drawings, prepared by the Bureau of Construction and Repair (predecessor to the Bureau of Ships, established 1940, and today's Naval Sea Systems Command), were used to illustrate potential ship designs for the Navy's leadership. In most cases, these plans were provided to the General Board, which advised the Secretary of the Navy on matters concerning ship designs, as well as many other things, throughout this period. The plans sometimes were prepared to inform the Board of the likely implications of certain candidate design characteristics goals, informing the Board prior to their selection of firm characteristics used to form the basis for design. In other cases, the plans were prepared in response to the publication of such approved characteristics, and then modified in response to requests for insights concerning adjustments, often sought subsequently to obtain a smaller, more affordable vessel. Some drawings in the collection are undated but are believed to date within the time period shown for this collection, in some cases based upon research in textual records at the National Archives. The earliest drawings were prepared by the Bureau of Construction and Repair's Scientific and Computing Branch, which was established by 1911, and by its successor organization, the Preliminary Design Division of the New Design Section, established by 1918. In almost all cases, these drawings were made by career civilian employees of the Bureau of Construction and Repair, working under the guidance and supervision of Navy Construction Corps naval architects and, in turn, at the direction of the Navy's command leadership charged with deciding on ship types to acquire. Many of the drawings prepared during the World War I years after afterward were made by James L. Bates (1880-1961), a naval architect who began work for the Navy at New York Navy Yard in 1903 and joined the Bureau of Construction and Repair staff three years later. He later served, during 1938 to 1946, as Director of the Technical Division, Maritime Commission. Termed "Spring Styles" by the Preliminary Design staff (after ladies' fashion catalogs), the drawings were an important part of the development of the design of a particular ship class. The "Spring Styles" plans usually represent only some of the options presented to the General Board, with the others existing only in tabular form. They also typically do not represent final designs, which were developed in detail to support construction work following approval of basic characteristics by a different office within the Bureau of Construction and Repair. Notable changes often were made during the final design process, and these therefore often are not represented in the present collection. The drawings in this album provide insight into the full range of Navy ships constructed during this era, however, as well as on many concepts that were not selected for construction. The current contents of Book # 1 were created at the Naval History and Heritage Command by merging two separate sets of papers into a single common chronological sequence. As received, one album labeled Book # 1 comprised original artwork, ink drawings executed either on paper or linen sheets, laid loosely in a binder whose metal mounting clips had broken. A separate unbound volume, lacking a title, included similar and in some cases identical drawings, all existing as blueprint, machine-reproduced copies of such original drawings, all created at about the same time as the original ink drawings. Unique drawings were taken from this collection of blueprint plans and merged with the original ink drawings into a single common sequence, assigned in 2008 by the Naval History and Heritage Command, to best recreate the history of preliminary design in this era. Both volumes in this collection of early design drawings were transferred to the Naval Historical Center many years ago, after their utility to contemporary design needs was determined to have ended. The Binder #1 is of loose-leaf format. Its individual plans are of a variety of sizes, though many employ a standard format sheet 11.5 inches high by 15 inches long. 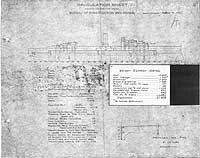 A number of the plans, both original ink drawings and blueprint copies, have informal pencil notations on them that appear to date from the time that they were created. This collection of preliminary design drawings is fragmentary. By no means all the preliminary designs created during the years 1911 to 1925 are included. Study of the drawings shows that several different numbering schemes originally were used to organize them, and the numbers shown show gaps, indicating missing plans. Most of the drawings have identification numbers in a single sequence created by the Scientific and Computing Branch. Many also have pencil annotations indicating other selected groupings of some number of plans, the specific purpose for such subaggregations no longer being apparent. Certain small groups of drawings prepared to show options to fulfill a single specific set of characteristics are identified in their originals by a common numbering system, such as "Schemes 1 through 4". Many of the design tasks undertaken to produce these particular drawings also are documented, often in great detail, in the collection of preliminary design workbooks held by the National Archives in Washington, D.C., as their holding "Ship Preliminary Design Data, 1914-1927", currently Entry 449 in the Preliminary Inventory No.133, "Bureau of Ships". In a number of cases, duplicate blueprint plans for these designs have been bound into those workbooks. In some cases, the original ink on linen drawings that provided the basis for blueprint plans in Lot # S-584 may be found in National Archives P.I. 133 Entry 449. In a number of cases the identification here of drawings in Lot # S-584 that lack description or dates is based upon research in National Archives P.I. 133 Entry 449. A few of the later designs in Book # 1 are documented in preliminary design workbooks held in the National Archives College Park facility, in particular the river gunboat drawings and some of the later cruiser drawings. Unfortunately, many of the preliminary design workbooks for the period 1922-1942 were destroyed, many in the mid-1970s, at the Suitland Federal Records Center as being no longer essential to retain. Two other volumes in this series currently are held by the U.S. National Archives. These are Book # 3 (1938-1944) (formerly Naval History and Heritage Command Lot # S-511) and Book # 4 (1946-1954). The drawings in Book # 3 were copied at the Naval Historical and Heritage Command prior to transfer to the National Archives and may be found on this same website. Persons interested in the original material held by the National Archives should contact the Cartographic Branch, National Archives, College Park, Maryland, for information. Records of past holdings at the Federal Records Center at Suitland, Maryland, include citation of an additional book in this series, covering the years 1924-1933 (in two "packages"), included in Federal Records Center Accession # 13163 as of about 1970. This book currently is not on the shelf at the Federal Records Center and is unlocated, perhaps destroyed in the mid-1970s when large quantities of U.S. Navy preliminary and contract design files held there were destroyed, having been determined by the Navy as not essential for preservation. Auxiliary Vessel and District Craft Preliminary Design Drawings. Note: Three "Battleship Cruiser" drawings (# 136-138) are listed on both the Battleship and Battle Cruiser pages. Many of these pages and images bear obsolete credit lines citing the organization name: "Naval Historical Center". Effective 1 December 2008 the name should be cited as: "Naval History and Heritage Command".